​The title says it all! Kevin met the This Is Us lady (the one that isn't Mandy Moore), and then we talk about how to have super great sounding audio. 246: Our friends don't watch our videos. ​And they probably don't listen to our podcast either. This week, we talk about the Oscars, how to get your friends to watch your videos (good luck), how to talk about controversial topics without alienating people, and then finally which Podcast distribution service is THE BEST. ​This week, Kevin shares his experience so far driving for Postmates. Also, we are joined by the ONE AND ONLY Corban Garcia. That's right– the guy who does our shownotes for the website! He tells us all about how live production works. 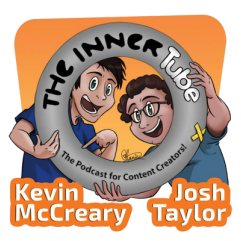 244: Trying to be humble, while promoting yourself & your content. HOW TO BE HUMBLE (IT'S EASY). HOW MANY EDITING PROGRAMS SHOULD YOU KNOW? HOW TO GET RID OF HISSING! ​This week on the show, have memes become too mainstream? MEMESTREAM?!?! And we got a question about what kind of music we're into these days, so we took it as an opportunity to talk about All the Bands We've Loved Before. We cover a lot of ground on this episode of the podcast! Hope you enjoy this conversation.